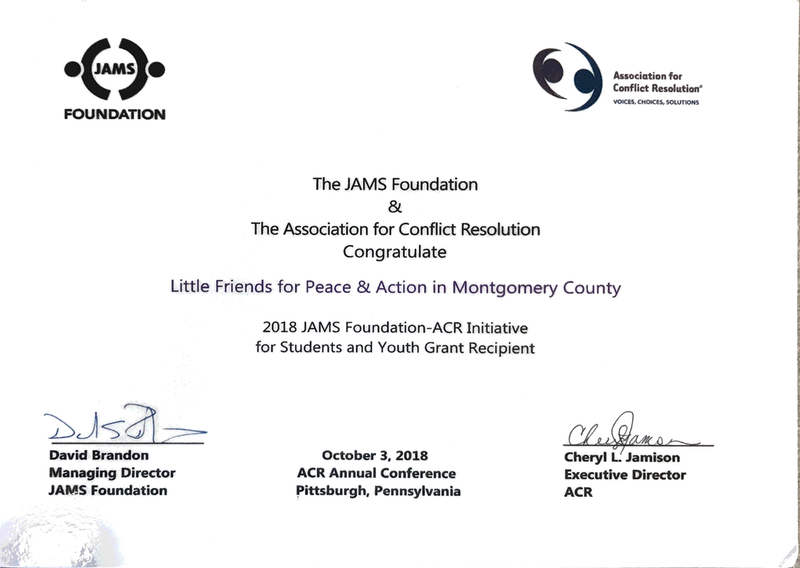 LFFP and Action in Montgomery County (AIM) were awarded a grant to support their 2-year joint project, In the Shelter of Each Other: From Personal Wellness to Empowered Community. This project centers on two adjoining elementary schools in Montgomery County, Maryland: St. Francis International School and JoAnn Leleck School. Both schools serve highly diverse populations, including a high percentage of immigrants, and about 10% of the students are African American. The most common environmental condition to the students at both schools is trauma. The proposed project will implement conflict resolution learning and practice through services and opportunities provided to teachers, staff, parents, students, and the surrounding community. The goal is to meet urgent needs identified by community members, including gang violence prevention and safe spaces for children. On May 14, 2016, MJ and Jerry received the Kit Collins Micah Award from the Stuart Center in Washington, D.C. This award is named after the founder and director of the Stuart Center who was known for her strong spirit and dedication to social justice. It is presented to a person or group who exhibits much of the same qualities as Sr. Kit Collins. MJ and Jerry Park and were recognized on May 11, 2016, for their work in partnership with Saint Francis International School. Msgr. John Enzler and Deacon Jim Shanahan from Catholic Charities DC celebrated the Innovations in Catholic Education Award from Today's Catholic Teacher magazine, and the school's peacemaking project that was the focus of the award. During Mass, Fr. Jacek Orzechowski, O.F.M., explained the importance of peacemaking in the message of Jesus and the central role that peacemaking plays in the Franciscan tradition. In both 2014 and 2016, LFFP and Volunteer Coordinator Kristen Pinto, were honored with two awards from The George Washington University for fostering a university partnership and advocating for positive change in the community. In 2008, MJ and Jerry were honored as Pax Christi USA's Peace Educators of the Year for their influential peace education in diverse settings. Read more by clicking here.